Submitted by Lauren Watel on 25 June 2014. 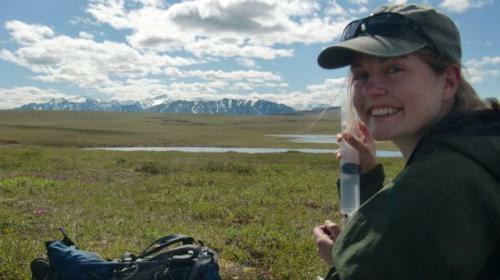 Alice of Team Lake filtering some of her lake water on a beautiful first day of sampling the I-Series Lakes in the Toolik Lake watershed. 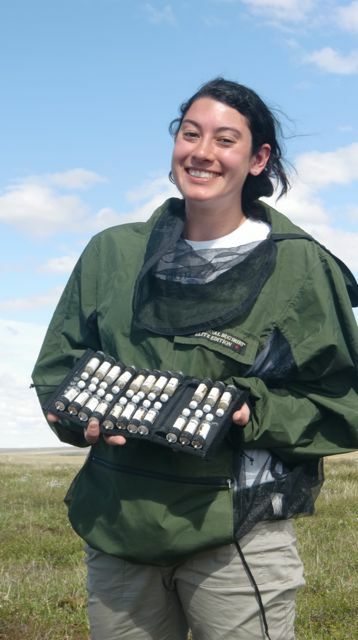 The I-Series is a two day sampling effort that is a pretty big undertaking for water sampling at Toolik. There is even a I-Series Ferret who visits the night prior dropping off fun goodies and snacks to pump people up! Hannah a cross-over between Team Microbe and Team Land-Water waiting to measure some bacterial production during a rainy day of the second day of the I-Series. 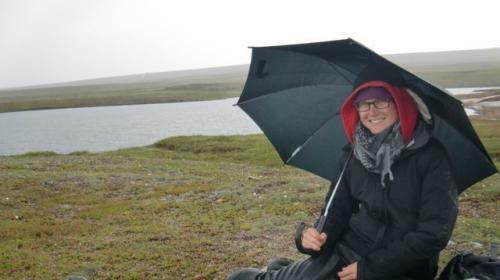 Note: the umbrella is used to protect her sampling and procedure in the field, it's not her rain gear. We just finished our second big day of sampling for the I-Series (The weather was totally opposite between day 1 and day 2!). This means that we sampled all of the main bodies of water in the Toolik Lake watershed. The goal is to record a variety of measurements about how the water coming in to Toolik Lake changes through the landscape. There are several teams that take part in this very coordinated team effort. Members of Team Lake (Alice, Levi and Dan) head out into a lake to gather samples from various depths to test the microbial community composition, physical and chemical properties of the lake. There is the Lakes Team goes out in a small raft and collects a variety of data from different depths in the lake. They want to see how the water chemistry (things like pH, nitrogen, phosphorus, carbon and other nutrients), biological (productivity and zooplankton) and physical properties (things like temperature, and dissolved oxygen) change with depth in the lake. The Lakes Team will also kindly bring Team Microbe back samples from the various depths in the lakes as well. MIke of Team Land-Water (Jason, Chris and MIke) help to measure the chemical and physical properties of the inlets/outlets and any stream that flows into a lake. The Land-Water Team goes along all of the various stream inputs in the watershed and records things like the depth, how fast the water is moving and the same chemical and physical properties as the lakes team to better understand what the different inputs into the water system are. Depending on the location the Land-Water Team may bring Team Microbe back samples as well. Dr. Rose Cory with the equipment for understanding how the light profiles change in the different water systems. This will allow her to assess how the light is impacting the chemical properties of these bodies of water. Team Photo (Dr. Rose Cory, Adriana, and Katie) is trying to get a profile of the light intensities to understand how the light changes in these different systems and at different depths so that they can correlate to understand how the UV light is interacting with the carbon in the system. Team Microbe heads out to collect bacteria from all of the various sites, lakes, inlets and outlets. This way they can measure how productive the system is, as well as understand what microbes are present and if they change from location to location. When Team Microbe heads out in the field, whether it is for the I-Series or any other day of sampling, the process looks similar. We are responsible for collecting water samples and filtering them to capture the microbes in a filter. It's a fairly straightforward process. There is a predetermined system of where we will obtain samples from. Rinse collection bottle with water to be sampled- we always rinse 3 times. Dip sample bottle under the surface and fill with sample water. Bring sample water back to be filtered. Here is how we filter our sample water to collect microbes. Sample water is poured into the syringe and we place a sterivex filter on the end. The filter has extremely small holes to not allow the bacteria and any larger particles or organisms to pass through. The filter is then taken back to the lab and removed from the plastic case to start the DNA extraction process. Sometimes these can get very tough to force water through and we will have to use our knees or a caulking gun for leverage. After filtering approximately 1 L of water we add a DNA Extraction Buffer (or DEB for short) to kill the bacterial and stop them from growing so that there is no change from the time we removed them in their natural habitat to when we analyze them down the road. 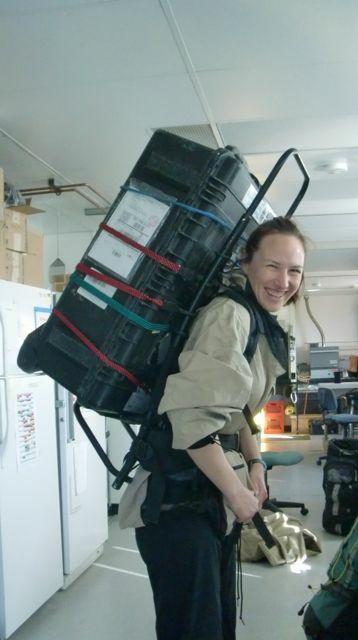 Sarah Nalven of Team Microbe after finishing filtering field samples from day 1 of the I-Series. We have everything carefully labeled and rinsed to ensure that we are keeping all of our samples straight and so minimize any potential contamination from other sources of bacteria (like our hands). Bring the filters back to the lab. As the water passes through the filters you can see that the filters are catching particles including microbes, they start to take on different colors depending on what all is in the system. Once all of this data is collected the teams enter it into a shared data base and analysis of the Toolik Lake watershed can begin! Today was a very wet soggy day, it seemed like most of the wildlife, other than a few sparse birds and the mosquitoes, decided to stay inside. So while we didn't see this critter here's another animal that lives in the tundra! My PolarConnect event is coming up this Friday at 11:30 AKT [12:30pm PDT, 1:30pm MDT, 2:30pm CDT, 3:30pm EDT]. I would love to have all of you join in to learn more about my experience in the arctic and Byron's research. It is free and easy, for instructions click here! Great journal, its nice to see what see what some of the different people in Toolik are doing. It is cool how this project is so interdisciplinary and how all the pieces of the puzzle have to be discovered and put together. Weather Summary: Colder, steady soggy rain through much of the day.